Alex J. Cavanaugh: A to Z Challenge - Memento, Meant to Live, Ninja News, and the Big Surprise! A to Z Challenge - Memento, Meant to Live, Ninja News, and the Big Surprise! Nolan’s greatest masterpiece. The story is told backwards, which makes you think as every new scene unfolds. You do not leave your brain at the door for this one! Guy Pearce is exceptional as the man with memory issues searching for his wife’s killer. This film is the ultimate mind bend. Leonard Shelby is focused on his goal. He might forget things, but never his ultimate target. Since every moment is new to him, Leonard possesses a child-like innocence. 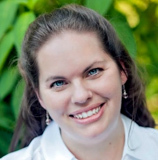 Her goal was published author and she never wavered on that path, achieving it this past February. Charity also possesses that innocence, and it comes through in her smile and her Faith. Her passions shine, no matter what she is doing. Charity is the author of The Magic Wakes and a devoted mother and wife. “We were meant to live for so much more… And everything inside screams for second life…” I will see that second life, Charity! Did you know that Leonard’s medical condition is real? It’s called Anterograde Amnesia – the inability to form new memories – and is a result of damage to the hippocampus. Switchfoot is a term from what sport/activity? L’s trivia answer - Nancy’s son attends Arizona State University and Rush formed in Toronto, Ontario, Canada. Shannon Lawrence at The Warrior Muse has a story, "The Family Ruins," in the anthology Sunday Snaps: The Stories, which releases today. Congratulations, Shannon! The latest in Andrew Leon’s Shadow Spinner series, Part 19, is available today and free at Amazon. You can also pick up Parts 15-18 free, along with his book The Evil That Men Do. Congratulations, Andrew! That’s right – another fun and easy movie blogfest! Something simple after the insanity of the Challenge and my last one until the fall. Hosted by me, Stephen Tremp, Livia Peterson, and Al Diaz. I remember watching Memento- it was a very captivating story. One more Blogfest. I'm sure the poeple will love it. From 12th to 26th of May I will be on holiday with my wife and without internett access. Dare I admit, I have never seen Memento - but now I want to, and Charity sounds like an amazing person. Loving all these introductions. I just don't get movie remakes. Why can't they make new stuff instead of messing up something that's already been done well? I agree, Memento is undoubtedly one of the greatest films of recent years. I've got Charity's book on my tbr list and I'm looking froward to reading it, hopefully soon! And congratulations to Shannon and Andrew! If I can get the post for your bloghop written/scheduled before I go on vacation, then I'm in. Memento is like da bomb, dude - and here's some trivia back at you: Name the cheesy Australian soap that helped launch Guy Pearce's career? You found a great new blogfest theme! Maybe I'll join to it. and you can manage another blogfest within a blog challenge. Best of luck to ye. Rather you than me. Another great Mix and Match it is such a good theme. Already signed up for the blogfest. I haven't seen Memento, but now I want to! Loved this post. Memento was a great film, but I always wondered what it would be like to watch it forwards instead of backwards. Probably an option on the bluray to do that. Memento was a captivating movie, and you really couldn't blink for a minute. Charity sounds like someone I would definitely like to meet. I've never seen Momento, but I want to now! I'll be sure to follow Charity, that's great she met her goal! Love love love love love Memento!! Love!!! A switchfoot sounds ever so naughty! LOL!! Off I go now!!! I don't think I've ever been so confused the first time I watched Memento! What a great film!! I like stories that go backwards. Just one long flashback. I'll keep my eyes out for Memento. Thanks. I did some research on anterograde amnesia for a book I wrote. I've wanted to see Memento for a long time. Charity is a nice pick, I've got The Magic Wakes on my TBR list. I'll have to have a think about all the remakes out there, but hopefully I'll be able to sign up for the blogfest! Edi, on holiday sounds a lot more fun. Rhonda, bring your big brain. Mark, can't remember the name, but he was in two series I believe. Moody, believe it or not, it is!! Kitty, wait until you see the answer. I don't think I have ever seen Memento! Signed up or the Blogfest! Sounds like fun! I can think of a few crappy remakes. Can't wait to see what everyone comes up with. Never saw Momento. Guess I need to. Alex how did you get to be so awesome? Thank you so much for the song! I think it's perfect! I haven't seen Momento, but now I'll have to see if it's on Netflix. May will be dedicated to moving into a new house. Hopefully this will be the last move for 10-20 years! :) I'll be ready for fall blogfests though. I remember having to watch Memento twice to fully grasp what happened. What a wonderful film...truly original in every way. 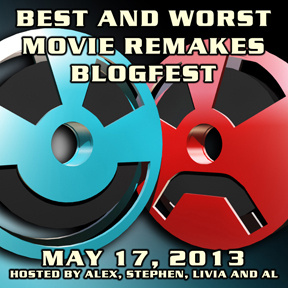 I am looking forward to The Best and Worst Remakes Blogfest! I think I posted about that form of amnesia a while ago. There's one that's similar where the person cannot recognize any one's voice. They have to see your face, otherwise, even their significant other's voice is meaningless. Then there's the "Foreign Language Syndrome" where a person has a head injury, and when they wake up speaking with the ability to speak fluently in another language. So weird. Since I love movies, I decided to play. Haven't seen Momento. Way to go Charity! I think Switchfoot is a perfect choice for her. Yay! An easy blogfest, whew! I haven't seen the movie Memento, but enjoyed reading your posting today! Of course I can think of a few remakes! I want you to know how determined I was to get signed up - having dyslexified my first name no less than THREE times to accomplish it! :) Sheesh! Cool blogfest! I think I'll sign up. Also, cool that Rush is a Canadian group. I saw Memento for the first time last year, and then asked myself "Why did I take so long to see this?" Definitely a brilliant movie. Also, I'm excited to hear Shannon's anthology is finally out! Nick, hope you can join us. Charity, you're welcome! Selecting your song was the easiest. Hope you don't move again for a very long time. Laura, that made me laugh! And sorry, not soccer. Have there been any good remakes? I'm drawing a complete blank. Memento is an amazing film. Will get my thinking cap on about the worst and best remakes, worst ones should be easy enough. Maybe the best is actually the worst, if you know what I mean. Hello Alex -- Thanks for a great post. I need to get out and see Momento. Sounds like a great flick! The brain is an awesome organ but when it short circuits, it affects its host incredibly. I'll probably pass on your next blogfest. Sorry. Signed up for the blogfest! Charity definitely deserves the spotlight. She has worked really hard to achieve her goals. Memento is such a trip! I need to watch it again. 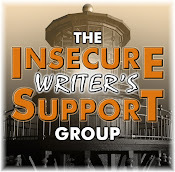 All signed up for the blog fest! Can't wait. Already have a pretty good idea of what I'm going to use. Happy Monday! Momento is such a crazy movie. I have the DVD version where you can watch it in chronological order. It's interesting. Yay for a new blogfest! Memento definitely holds up! I re-watched it with a friend this year and was struck by how tight and earnest the story is. It also treats cognition more robustly than most amnesia stories. We discussed Memento for hours after seeing. I haven't seen Momento but do appreciate an great Mend Bend. I'll watch it this week. Looking forward to the Best and Worst Movies Blogfest too! Switchfoot is a term from skateboarding, I believe. Yeah, Memento blew my mind. Great movie. I know and follow Charity. Also, read her book. Very well done. Signed up for the remake blogfest. I so enjoyed the last movie one you did, I just couldn't help myself. Remakes almost always disappoint. Except, maybe, the super hero ones. It's like they need to redo it for the next generation with the new technology. It's ok. And, Hollywood hasn't run out of ideas. They just reject new ones because they're playing it safe. New screen writers may not ever get "in". Will have to go and visit Charity. Thanks for the recommendation! Thanks also for all the info. Happy Monday! Memento is an amazing film. I love films that make you have to work to get the most out of it. I've not met Charity yet. Any blogfest involving movies and I'm most likely in. As for the bonus, would a soundtrack remake be acceptable? I liked Memento, but I always figured he could keep better notes. Still, wasn't Carrie-Anne fabulous. Bravo, Charity. I like your audacity! Memento is definitely a movie to watch more than once. Andrew, you're welcome. And I can think of a few. SL, we do as well, although we haven't watched it backwards yet. Roland, I hope it's good as well. Man O Clay - very close! Mary, you're right about them playing it safe. I've never heard of Anterograde Amnesia before. That has to be one "interesting" affliction. I can't imagine. I'm awash in trivia these days and I don't seem to know the answers to any of it. I'm beginning to wonder what that means. Like, am I 100% out of touch? Can't take on your great May Hop. I'm on official leave starting May 1. It will be fun, I know. Charity rocks! And I love that song!!! Great picks as always! I have a story in the Sunday Snaps Collection too! Congrats to Shannon and Andrew! Trivia: Switchfoot - from snowboarding and maybe skateboarding. Memento blew my mind. I need to watch it again. Halfway through the A to Z, Alex! I haven't seen Memento. I remember hearing about it. I might just have to pick that up. Ooh not see Memento - sounds good, will check it out. Have you ever watched Memento in order? I've seen a list of scenes in chronological order, and you can go through the DVD and play them in "true time." I haven't done it, but it would be cool. I haven't seen Mememto. Must add it to the list! Another fun blogfest, yea! Great recognition for, Charity. . I loved Memento and what a mind bender. I had no clue that was a real illness, how frightening. Worst song remake: Tell it like it is, by Heart, originally by Aaron Neville. Momento was a great movie and one that had me guessing up until the end. I've never heard of this movie, but it sounds like one I'd like. (Kind of like Inception. I like movies that makes one think.) I will have to try and find it. Also, close on guessing who used the quote from Star Trek. It was actually McCoy to Spock during the episode where they have to fight in the gladiator type battle. Memento is the ultimate mind-bend Alex. I hear you can actually watch it again and question whether his memories are even real. I can't go there though. Sounds like a great blogfest! That Switchfoot song is super uplifting. I wanna do a movie blogfest because I plan to blog a lot more on movies in the coming month but I can't think of a single remake I'd wanna profile ... Hmm. A great flick, a wonderful choice for tribute (of course I know & follow Charity,) & an inspiring song! As for my son's college, yes, ASU, but only for 2 more weeks. He's coming home, yay! For today's trivia, hmm, soccer maybe? Congrats Shannon & Andrew! I'm all signed up for the blogfest, but I'll have to give it some thought. Oh that's a really good blog fest you got coming up. I'm either going to blog about Total Recall or Conan. Both of those remakes were absolutely terrible. Huzzah for Charity and Andrew! I thought it was funny when I discovered I had the special collector's edition of Memento. I had no idea I'd bought it, but one of my friends pointed it out to me. Lee, you just have a good time! Rick, it's on my DVD, we just haven't watched it yet. Meilssa, that one was awful! Jack, I tried! And you would dig Memento. nancy, I know you'll be glad to have him home. And not soccer. Michael, those two were all right. I've seen much worse. Okay count me in for May 17th. This seems simple enough. Memento sounds like a great film. I'm a fan of Charity already for her dedication to be published. She's my hero today! I just signed up for the blogfest. You do know you have created a monster with your blogfests, right? haha I look forward to it. Thought I'd mosey on over and say hi. Congratulations to Charity for not giving up! Gotta feel good. I have to think on the worst/best blogfest a bit. I like easy and fun. Best and Worst remakes blog hop - that will be interesting! I don't know Charity. I'll have to stop by and visit her. She sounds nice. I still have not seen memento. Just told Father Dragon I won't be joining this new blogfest, don't see enough movies I'm afraid, original or remakes. Sorry. Oh wow, I didn't know about Shannon's story! How awesome for her. And I've got Charity's book on my list, looks like a great one. Memento. Now I havvvee to watch that movie! Memento was a really neat movie, and that's cool you linked it to Charity. Congrats to Shannon and Andrew too! That's an awesome blogfest. Hmm, now I'm thinking about it already. I never saw Memento but it sounds like I should. And I signed up for the remake blog hop. I'd guess switchfoot refers to soccer. Wouldn't it be awful not to make new memories? Thanks for visiting my blog and for being an A to Z sponsor. I may just have to participate in the movie blogfest. My birthday and a list of awesome/bad/awesomely bad movies are a wonderful combination . And Memento is on my list but I feel as though I really need the right mood to watch. Memento was one of the better postmodern stories, a form so many try to execute but fail miserably. I had never even heard of Momento until your movie blogfest. I still haven't seen it, but I will! Anterograde amnesia? Never heard of it before. Congrats to Shannon and Andrew! Memento has been on my to-watch list for a while because I LOVE mind-bending memory stories (I may have even written one :) but I haven't seen it yet. I love Meant to Live by Switchfoot. I so wish I can belt out those lyrics without croaking--even more, i wish i could rock that guitar! I have to see that movie! I've heard so many good things about it and I love that actor. I'm putting Memento on my list to watch! Learning about a lot of movies here. Big fan of Memento. I think I had to watch it in high school. don't remember why or for what class. Maybe Psych? Lee, knew you couldn't resist! Julia, if there are as many participants as the last one, it will feel like a monster! Ilima, I bet you can! Nutschell, I can do both, just not well. Megan, seems a likely fit. Haven't seen Memento but it sounds riveting. I can't imagine anything worse as a writer--forgetting things and losing our memories! Ah Memento is an AWESOME movie now I want to watch it again! Guy Pearce is an actor I enjoy, so "Momento" goes on the T.B.W. list. thanks. I'm embarrassed that I haven't seen Memento. I guess I don't want the brain-pain. The bloghop sounds fun. I'll enjoy visiting; I doubt I've seen enough remakes to participate. But from reading above, if Guy Pearce is involved, ummm... yeah!!! Momento is one of my all time favs. And we're supposed to be at M? Oh damn. What a nice song tribute. I'm heading over to meet Charity. David, that made me laugh! I'd hope they would be forgiving at a church. Robyn, just need to name two. I love the big surprise - a movie blogfest! Can't wait to participate and co-host! It's gonna be so awesome with you Alex because you make everything awesome! I've read Charity's blog before, but now I should follow her. Nice highlight! 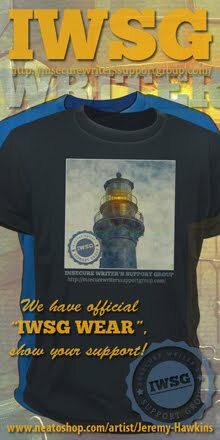 You're still keeping me in suspense who will be featured. There's some pretty cool bloggers in this community! Memento blew me away first time I saw it in the theatre. I wish i could see it again for the first time. I'll have to sit your next blogfest out since I"m taking May off. Yay! Another Switchfoot song. :) And hooray for Charity! Memento is a real mind twister. Hmm... looks like I will be adding Memento to my MWL (Must Watch List). Woot for Charity. She has such a beautiful smile. Happy Monday! Livia, still thirteen more to go! PK, develop his disease and you will! Not recommended though. Susan, I will later tonight! I can't believe I've never seen Memento. It is going on my to watch list. hated Momento- sorry. Just saw ARGO and actually loved it. I was ready to dislike it...so there ya go. My wee brain is so fried I can't even think of a remake. If and when I do, I'll come back and sign up. Congrats to Charity for being your featured blogger. You're the coolest of the cool for doing this, Alex. Memento sounds super good. Now I want to see it! Charity is awesome and so is her book! I'll look into Charity's books -- a big congrats to her. And I'm ashamed to say I've never seen the famous Memento, so on of these days I've got to catch it. I've not seen Memento yet. It's one I've been meaning to get to. The blogfest sounds like lots of fun. Go Charity! Persistence pays off. I've always wanted to see Memento but never got around to it. Carol, I bet you can before May 17. Now I'm going to have to watch Memento. Am I crazy for signing up for another blogfest? Probably. I have Momento on my list. Another fun blogfest! I've got to say, I was really angry with our local classic rock station when I found out that Blinded by the Light is an awesome Springsteen song - and they've been playing the cheesy Manfred Mann version for decades how, and never once mentioned the Boss! Grr! Oh no, I've not seen Memento. A nice dedication to Charity. Time for me to have a blogfest about not having a blogfest. No, no, not another blogfest. I can't take it. Oh, Memento is one REALLY intriguing movie. I've seen it twice so far. I'll bet it doesn't matter how many times you watch it there will be something new to notice or understand in it. I have got to see Memento...maybe I will download to my wife's iPad for the vacay. I think switchfoot come from soccer?? Or maybe idea at all!! Good idea for a blogfest! I love your blog fests, but don't do movies really so would be lost with remakes. Memento is one of the best films ever made. Awesome choice! Deniz, Bruce did it first. Gary, that would be funny. Better late than never... right... I meant to stop by earlier, but I got sidetracked. YAY. Charity! Love the premise of her book and can't wait to dive into it.... if I ever get a FREE SECOND! LOL. I"m stil in awe on how you do it! I sincerely and honestly wish I could. But Time never seems to be on my side. But I am happy about keeping up with the challenge. Just THREE MORE.... YAY! I can't believe I wrote 23 already and it's only the fifteenth! I absolutely love Memento and anything Christopher Nolan does. No one will be able to remake that. Movie blogfest you say? I'm in! I loved Memento. I'd watch it again. I"m looking forward to the Remake Blogfest, and although I will not participate, I will be reading the post. Oh, yeah - there will be tons of fun! If it's a movie blogfest, I'm all up in it! You've found my weakness...it's my kryptonite. I love this idea! Hmm, I'll have to get thinking. Best remake .... hmmm. I dunno. I'd really have to think about it. All signed up for the blogfest. It's going to be terrific! I did not know Leonard's condition was real. How interesting and sad. I will definitely have to look out for Charity. Charity has a great smile! Yay for Charity! Thank you for the mention, Alex! Alex, thank you again for the extra exposure. You have the best ninja army following you and I'm honored to be a part of it all. Reading comments makes me feel good about trying to be myself no matter where I'm at. It's worth it isn't it? And so much easier than trying to "fit". I love Memento! One of the best movies EVER. Wish I knew more about remakes, but alas, I have no clue. So I'll be passing this time around. It's all good though. My daughter will be graduating from college, and we'll be super busy with family and celebrations during that time anyway. Wishing everyone a great time and a very successful hop! That blog challenge looks like fun! Then again, they all do. I wish I had more time for these challenges..I can barely keep up with regularly posting these days. I'll get around to one of them some day!!! Just signed up for your remake blog hop. Looking forward to it! Sounds like a fun blogfest! I look forward to seeing what people have to say.